The Scottish Isle of Cairnmor is a place of great beauty and undisturbed wilderness, a haven for wildlife, a land of white sandy beaches and inland fertile plains, a land where awe-inspiring mountains connect precipitously with the sea. To this remote island comes a stranger, Alexander Stewart, on a quest to solve the mysterious disappearance of two people and their unborn child; a missing family who are now heirs to a vast fortune. He enlists the help of local schoolteacher, Katherine MacDonald, and together they seek the answers to this enigma: a deeply personal journey that takes them from Cairnmor to the historic splendour of London and the industrial heartland of Glasgow. Covering the years 1936-1937 and infused with period colour and detail, The Call of Cairnmor is about unexpected discovery and profound attachment which, from its gentle opening, gradually gathers momentum and complexity until all the strands come together to give life-changing revelations. 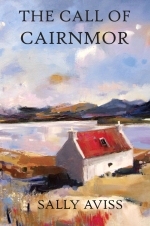 This first novel in the Cairnmor trilogy (followed by Changing Times, Changing Tides, then Where Gloom and Brightness Meet) moves between the rugged rural isle itself, a quiet country mansion in Oxfordshire, the industrial yards of the Clyde, and the chambers of London lawyers, with a climax in the House of Lords. Mystery and love are intertwined in a story suitable for young adults through to old romantics. Sally Aviss comes from East Kent and her love of sailing has taken her to many coastal areas of the British Isles, including several islands in Scotland. Most of her working life has been devoted to music, both as player and teacher, but she has always loved writing. The Call of Cairnmor is her debut novel and was written for her daughter.